We would love to make music with you! We highly encourage you to enroll for the whole semester to get the full benefits of the class. Throughout the session you will notice an increase in participation and in your child's musical development. We offer sliding scales for low income families. Please fill out this form to apply. We will have a break the week of May 27 - June 1st. We will have a break the week of November 25 - 30. Classes are pro-rated on a weekly basis. Community and friendships with other folkie parents and children. Over the course of the semester you and your little ones will learn the words and movement to a large repertoire of great songs to sing for a lifetime to come. Your spot in the class will be guaranteed upon receipt of your payment. We require two class time choices, as classes which do not reach minimum registrants may be cancelled or condensed with another class on the same day in an adjacent time slot. If you can not make a 2nd class time, please feel free to email us, and we will let you know whether or not the first class time of your choice will be running. Siblings under 5 months can come for free when attending with older registered sibling. Although we do not offer refunds, we are happy to offer credit to be used towards future semesters or other Little Folkies offerings. Credited monies must be used within 6 months of cancellation. Certain class times offered may be cancelled due to under-enrollment. In this case, you will be transferred to your 2nd class choice. In the rare instance that class gets cancelled due to teacher illness or an emergency, students can make up the class anytime during the semester, or transfer a one-class credit to the next semester if need be. No refunds will be offered for teacher sick days. We are offering one-time welcome drop-ins to folks who are interested in the class and want to give it a try before committing to the whole semester! If you’re still not sure after your first class, we give you one more drop-in just to be sure! Please fill out the form below to schedule your Winter 2019 drop-in with us. 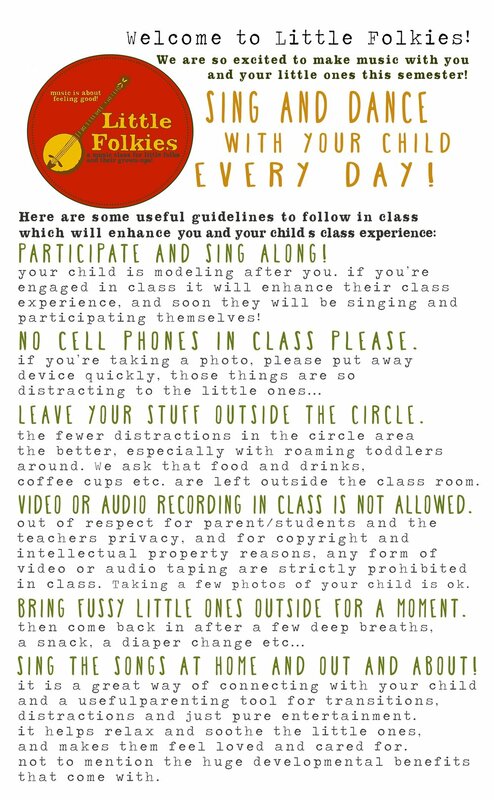 Here are some useful guidelines for your optimal enjoyment of the Little Folkies music class. We hope you enjoy!